Customer service through WhatsApp is hot and happening, especially in Europe. Quite a few European companies are now using WhatsApp to help out their customers. They love to know that they’re displayed on their customers’ contact lists, ready to help out whenever they’re needed. WhatsApp, however, does not offer a public API, which makes it hard for businesses to use WhatsApp as a workable service channel. 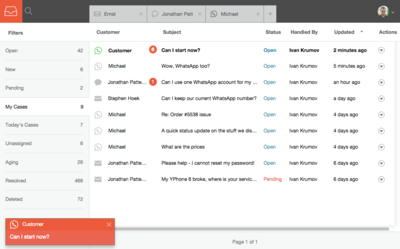 Casengo is currently the only multichannel helpdesk system to integrate WhatsApp. 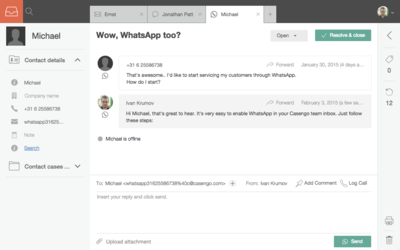 Casengo Enterprise and trial users will be able to manage WhatsApp conversations just as easily as emails, chat messages and social media posts. They will be able to prioritize, assign conversations to team members, view the customer’s history and use macros to respond quickly. This boosts both productivity and conversion. The integration will be rolled out over the next couple of weeks. Would you like to be informed of further WhatsApp/Casengo developments? Leave your email address here. Or try Casengo for free.